Z For Zachariah possesses qualities both appealing and disenchanting. What more can be done with the post-apocalyptic scenario that we haven't already seen and yet when this scenario contains only a trio of engaging actors might we actually get something enticing? Of course, there are numerous ways in which we could look at the factors that influence whether a film is appealing or not, but until actually taking it in we can't be sure what surprises it might hold. 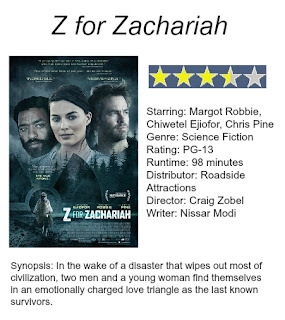 What surprises most about Z For Zachariah is not that the only three actors in the film deliver superb performances, but that they are so well written and developed that part of the narrative comes to be how these three individuals deal with one another's personalities and character traits. An aspect such as this is so inherent to our daily routines that we don't think twice about it, but when there is even a slight possibility these could be the last three human beings on earth the importance of how they get along with one another is magnified. Based on a novel by Robert C. O'Brien that was published in 1974 Z for Zachariah apparently diverts from it's source material in rather large ways to not only tell a tale of survival, but one of meaningful survival. We are first introduced to Margot Robbie's (The Wolf of Wall Street, Focus) Ann Burden as she digs through the remains of what we are led to believe is some nuclear war searching for anything she might be able to use in a hazmat suit. It is on her way back to what is more or less her own little oasis in a valley that has somehow remained unaffected by all of the radiation put off by the war that she comes across Loomis (Chiwetel Ejiofor). Loomis is a scientist who has been searching for exactly what he has stumbled upon and is more or less thankful to the humble Ann for taking him in and allowing him time to recover from his journey at her isolated farmhouse. With Loomis' knowledge and Ann's farming skills the two begin to make a place for themselves among the desolate landscape that surrounds them and maybe even kindle a little something more between them. That is, of course, until Caleb (Chris Pine) shows up about forty-five minutes in and things are made all the more complicated by the basic human dynamics that come into play. While what we expect from Z for Zachariah. given it is a movie. is for this love triangle to take over the narrative and derail the focus of the film from the larger themes it was attempting to explore prior to the entrance of it's third party (which, again, the book apparently doesn't have). Instead, it only serves to amplify these ideas by pushing them to a more tense, unnerving state. Religion is a heavy theme here in that Ann is a devout Christian who was raised as a preacher's daughter and whose father built the local church. Loomis being of a scientific mind is automatically assumed to be less religious if at all, but nonetheless he is respectful of Ann's beliefs. Bringing things back around to the importance placed on the gelling of the personalities it would seem these two were destined to be at odds with one another. Loomis wanting to tear down the church to build a water wheel generator while Ann seeing the church as the last thing they need to get rid of in this desperate time. What is refreshing is that this never comes to boil over as the dividing line between our two main characters. Rather, they respect one another and therefore show shades of more complex personalities, enticed by one anothers thoughts and eager to see if they can accommodate each others minds. There is a specific scene right after Caleb's arrival between just Ann and Loomis that speaks volumes to these ideas and it more or less serves as the basis for why this post apocalyptic world is worth venturing into even if it feels overly familiar. What makes the scene so affecting is that it is one of the few moments that puts aside the nuance of the characters and allows them to liberate themselves with no cautionary guard in front of their words. Ann clarifies that she'd reached a point where she was ready to give up on life while the appearance of someone else wouldn't have necessarily done the trick, but the appearance of Loomis specifically more or less saved her. Loomis can no longer keep a potential deal-breaker secret from Ann and in the aftermath of telling her the two are both still very broken, but wounds can be seen beginning to heal. What makes scenes such as this work as well as the overall tone reach it's intended and necessary tension level are the performances of both Ejiofor and Robbie. Ejiofor is a measured man who knows his limits and can read people well enough to have survived as long as he has and to know how far he can push them. Ann, despite her naive first impression, is smarter than she appears and capable of adopting certain perspectives so as to remain in line with the men around her. This is not to discount Pine, whose Caleb we never know whether we can trust or not. Caleb's eyes cut from Loomis to Ann with what could certainly be read as sincerity but comes off as more cunning and deceitful than anything else. The performances bleed the ideas that both writer Nissar Modi and director Craig Zobel (Compliance) seem intent to tackle and thus, by the time we reach the rather solemn conclusion (what can you expect though, really?) there is real weight to the drama. Z for Zachariah plays strong on it's characters interaction and buffers the sometimes laborious pacing with beautiful cinematography that captures the lush greens of the hills surrounding it's valley. What ultimately makes this a worthwhile endeavor though is the mysticism that Zobel is able to capture in his tone while never delivering anything more than a purely realistic, science-based reality. Again, given what we typically expect from movies and especially these types of movies I was surprised to not find more of a science-fiction edge to this film, but in keeping this genre aspect out of the realm of possibility and contrasting only the religious aspects with that of Loomis' scientist background we are given a world much like our own where we think we know the why's and how's of the reasons we've come to be as we are, but can only hope there is more to it that our mortal minds can comprehend. Enticing indeed.